Beach view at Ballenas National Marine Park. I finally went off the reservation yesterday. I’ve fully settled in here at PurUvita and decided to get a sense of how far a walk it is to the beach, stores, restaurants, etc. I’m not normally averse to a brisk hike, but the humidity here clings to you like skunk smell on a wet dog. So I fashioned a few do rags out of paper towels, loaded up my backpack and descended the daunting driveway that leads to the coast highway. The Costa Rican take on Garden & Gun? Vigilancia y Jardinería. 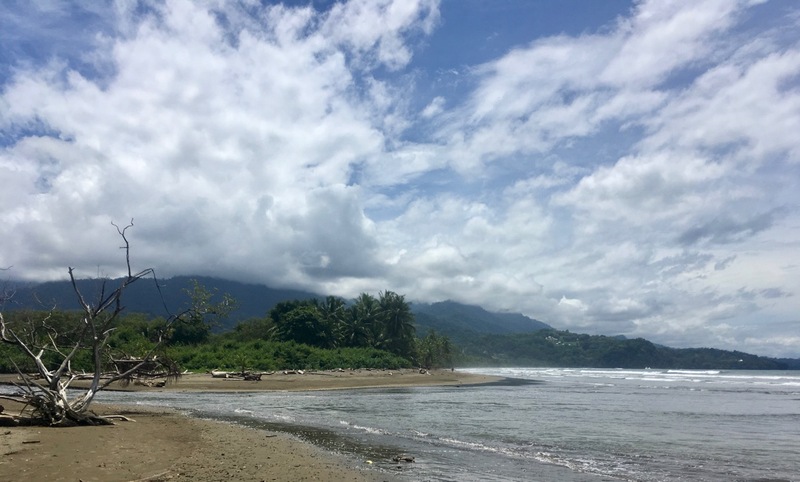 Playa Colonia, toward the southern end of Ballena National Marine Park, is just a a short walk north on Highway 34, then a left onto a dirt road that leads to the beach (la playa). Walking along the highway is a bit daunting. Drivers don’t slow down when they see pedestrians and there is no sidewalk. Just a narrow strip off the road. But it wasn’t long before the passing trucks I’d dreaded were welcomed for the cooling breeze they dragged along in their wake. 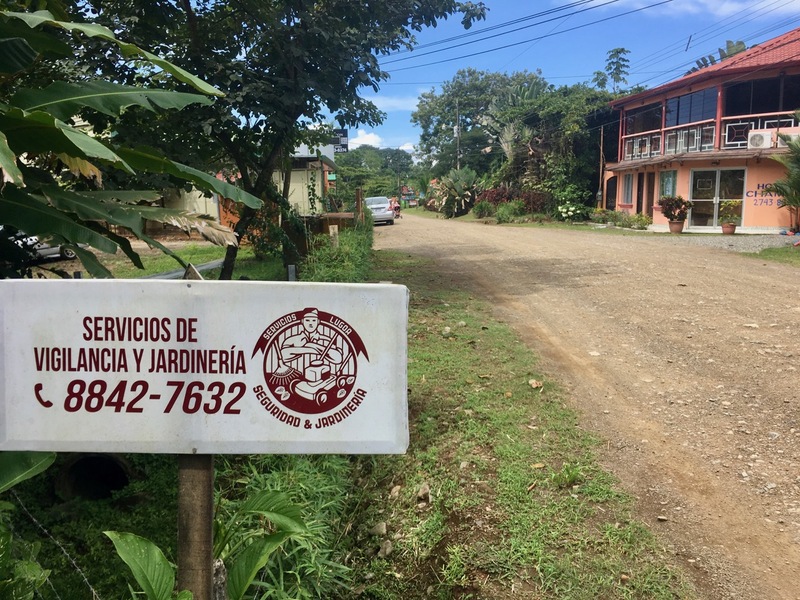 While walking, I saw an interesting little subdivision, an auto parts store, a veterinary clinic, a not-so supermercado and a sign for the Costa Rican version of Garden & Gun offering gardening and security services, all under one roof. I also saw chickens, dogs and a massive iguana that was as thick around as my arm. It was an easy walk to the beach (2,500 steps, or about a mile, based on my iPhone pedometer), and while Jeff told me how to bypass the toll booth ($6 US for tourists; $2 or locals), I decided to go through the official entrance, partially because the dirt road leading to the free entrance was something of a mud pit, and partially because I want to contribute to the care and feeding of this amazing resource. I do wish they had some sort of monthly pass. But I’ll create my own by using the free route more often than not. The beach is beautiful. Not in the sugar-white way Northwest Florida beaches are, but more in a remote, cool-place-to-camp aspect. It reminded me of the surfer beach in Sayulita, Mexico, we visited several years ago. There’s a small guard shack where I coughed up my $6 bucks and received change in Colones (exchange rate about 550 to a dollar). You can go straight to the sand, or, as I did, turn onto a double track that runs through the palms and brush behind the dune line. 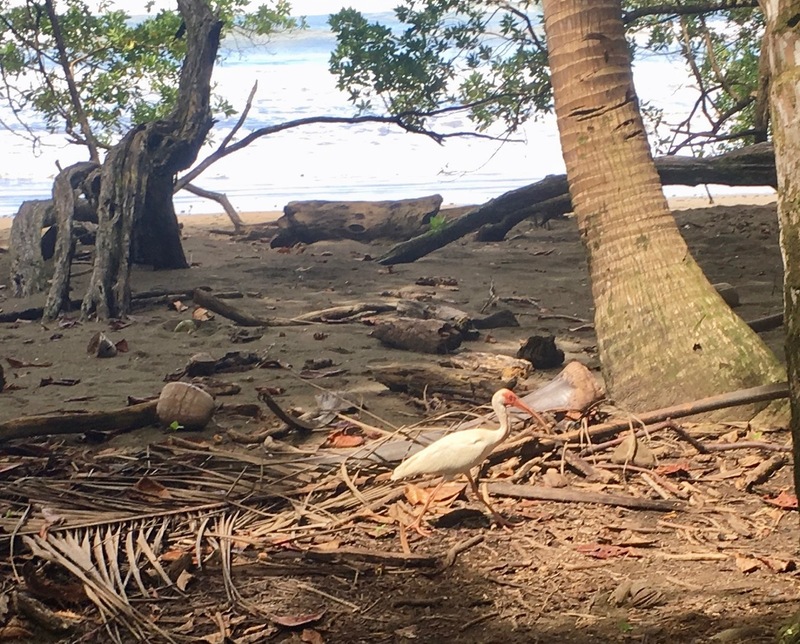 A white ibis near Playa Colonia. After walking for a bit, I found a spot to sit on a log and watch the waves, taking note of the surrounding palm trees to ensure I wasn’t sitting in under a bunch of coconuts that could drop and knock me senseless. An ATV with a few police officers rode by, waving as they went. But at 9:30 a.m. I had the place pretty much to myself. I continued on toward the Whale’s Tail. I wasn’t intending to go out there today (I hadn’t even checked the tide charts to see if it was possible), but I did want to get a sense of how far a walk it would be. Long, but not daunting. When I got to the spot where whale watching boats put in, on the south end of the Whale’s Tail, I cut back up inland and found the softball field where Jeff and I watched a gaggle of expatriates play softball on Saturday. From there I angled through the neighborhood to Flutterby House, which Jeff also introduced me to. They have wifi, iced coffee and decent fish tacos. I made a quick call to Lara to test WhatsApp and it worked flawlessly, but Lara was in the middle of walking Sunny in a rainstorm so we didn’t talk long. But damn, it was good to hear her voice. 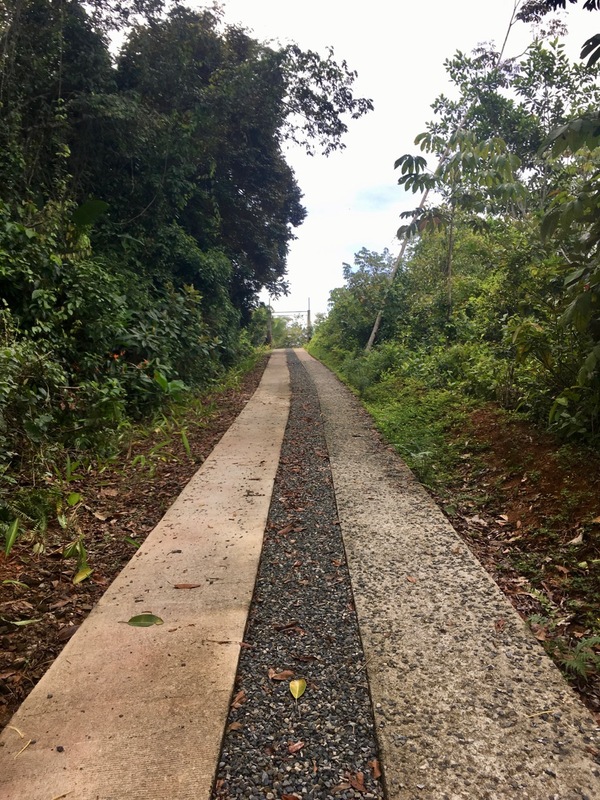 From there, I made my way back toward Playa Colonia, wading through at least one muddy track, returning to the beach and then retracing my steps up through the neighborhood. I did hit a small market over by the softball/soccer field to pick up a supplies. It dawned on me I haven’t eaten red meat or chicken since leaving the States. Don’t miss it. 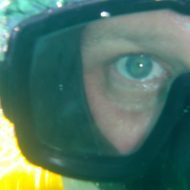 Once I arrived in Costa Rica and had easy access to fresh seafood, that was all I needed. Prices here are pretty much the same as in the States, if not more expensive. The exception is fresh fruits and anything local. But stuff that’s imported is pricey. My market run cost me almost $20 and I didn’t have a lot to show for it. Cheese, juice, water, black beans, tortillas and a few other sundries. The return left me sweaty, taxing my makeshift do rag to its limits, and the finale, a climb up the driveway, had me huffing. Don’t underestimate the effect of the tropical sun. The streets aren’t tree-lined, so when I was walking them the sun was vicious. The path behind the dunes at the beach is a different story. More shade, pleasant ocean breeze. In all, I logged about 16k steps today, or about 8 miles. That’s pretty much what I do daily at home thanks to Sunny’s insatiable desire for walks. After returning, I showered and spent the rest of the afternoon plowing through Poilu, where hapless Louis Barthas emerges from the slaughter of Verdun largely unscathed but having witnessed carnage on a scale I can’t comprehend. The book does a marvelous job of relating the grunt’s life. Boredom. Marching with no idea where you’re heading. And then the sheer terror of trying to survive in the trenches while the world is exploding around. He was a Socialist, which greatly impacts his view of the war. Sometimes it’s clear he identifies more with the German regulars more than his own commanders, who stay behind the lines in bunkers while the common folk are left to slaughter each other a few hundred yards away. As sunset approached (5:47 p.m.), I migrated up to the shack, where I heard a group of howlers down in the valley. Maybe they’re heading back my way. And the sunset was sublime. Definitely photo-worthy this time around. This is quickly becoming one of my favorite daily rituals. As the light faded, the bats came out, winging precariously through the open first floor of the shack and within feet of my head. I slouched, hoping their radar was true. And it was. 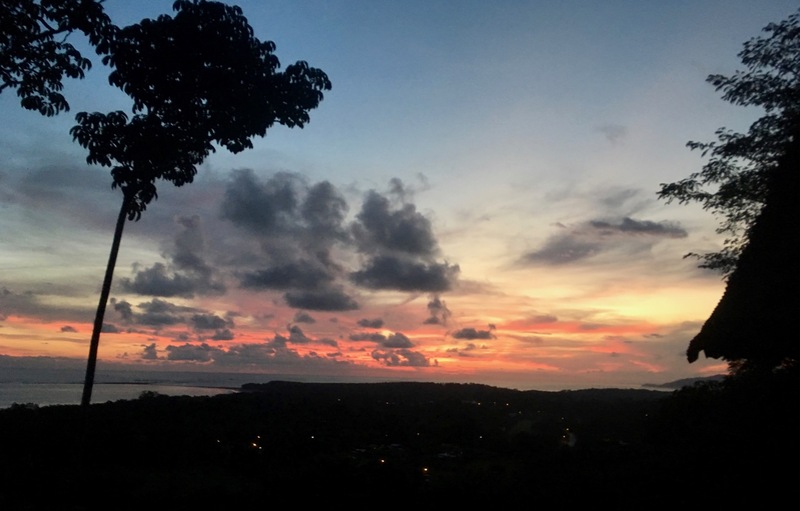 After a dinner of scrambled eggs, tortillas, cheese and an organic carrot, I found myself on the second floor of the building housing the kitchen/bar area, watching the stars above the Pacific while I sipped a rum and orange juice, my nightly offering to the sugar cane gods. The moon is in its waxing crescent phase, with the full moon coming Sunday. I’m really hoping for a clear night or two during the new moon so I can see the stars. No city lights here. Just the Pacific Ocean.